Save £1000pp on your 2020 river cruise with Gratuities included – MUST BOOK BY 30 June 2019. Relax this morning and enjoy an early lunch before your half-day tour of Moscow. 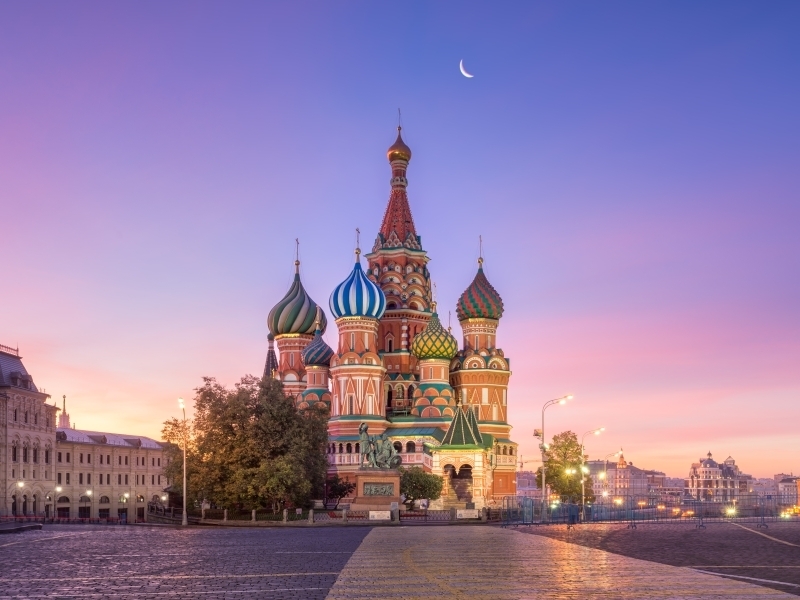 See the famed Bolshoi Theater and stop at Red Square for a view of the brightly colored St. Basil’s Cathedral and a visit to the famous GUM Department Store. You will also get the chance to experience the city’s Metro. Stay in the city center for an evening performance of traditional Russian folkloric music. After breakfast, travel to the city’s famous red brick enclosure known as the Kremlin. You’ll go behind its walls to see historic gems like Tsar’s Canon and Tsar’s Bell, and tour inside two cathedrals. Enjoy a scenic cruise along the Moscow Canal after lunch as we depart the city. We cruise through the morning. After lunch, disembark for your walking tour through the provincial village of Uglich, one of the Golden Ring cities that preserve the memory of Russia’s historical events. See the former Kremlin of Uglich and visit the Church of St. Dmitry on the Blood, built on the site where Ivan the Terrible’s son Dmitry was mysteriously killed. Then a local family invites you into their home for tea and friendly conversation. Depart before dinner; cruise through the night. We dock this morning in Kuzino, a typical Russian village. From here, you visit the renowned Kirillo-Belozersky Monastery, founded by Saint Cyril in 1397. Take a guided walk through the monastery’s historic grounds, seeing several small wooden chapels, the Assumption Cathedral and a museum. You also have the opportunity to visit a children’s school in Kuzino or the local Merchant House. Return to your ship for lunch and an afternoon departure. Spend the remainder of the day cruising along the Volga–Baltic Waterway. This system of rivers and canals, spanning 229 miles and seven locks, links the Volga River with the Baltic Sea. We cruise through the morning, admiring the tranquil waters of Lake Onega, Europe’s second largest lake, and arrive this afternoon at the island village of Kizhi. Set out on a walking tour through the Open Air Museum of Architecture, a UNESCO World Heritage Site. Here, see a collection of wooden houses, windmills and churches representing ancient Russian architecture, highlighted by the famous 3-tiered Preobranzhenskaya (Transfiguration) Church, a fairy-tale-like structure built in 1714 without a single nail. Depart in the evening and cruise through the night. Spend a relaxing day cruising Russia’s intricate waterways. Sail the scenic Svir River, traveling the 139-mile “Blue Route” as it takes you southwest from Lake Onega. Stop in Mandrogy and take some time to explore this museum village. Visit the Vodka Museum or shop for handmade Russian craft items. For a truly immersive experience, try an optional visit to a banya, a traditional Russian bath house. Or, on board your ship, take the opportunity to witness and participate in the art of matryoshka doll making. Continue along the Svir, then cross Lake Ladoga, Europe’s largest lake, on your way to the Neva River. All meals are served on board your ship. You have the day free to see the sights that interest you. Visit one of the many palaces, churches or museums, or take an optional morning tour to Peterhof Palace, with its landscaped gardens and beautiful fountains. In the afternoon, you may choose to join an optional kommunalka visit to get a glimpse of these communal living spaces or take an optional tour of St. Petersburg from the water. Lunch and dinner are served on board.